People born specifically on the 5th of May are predicted to be gregarious independent spirits, naturally talkative, with the usual bull determination and stubbornness. The ruling astrological planet for this particular day is Mercury influencing you to be both innovative and opinionated. If you have this birthday an open, friendly, outgoing temperament is bestowed on you but your emotions tend to be slightly cool. Despite this emotional detachment and your idealistic outlook your intellect makes you broad minded in your views and wholehearted towards commitments. Your array of many talents and ambitious nature mean you are likely to enjoy challenges. You are ordinarily immensely loyal to your friends and usually a great listener as well as talker. Your persuasive eloquence is expressive yet it hides your inner craving for affection and stability. Individuals with a May the fifth birthday are also highly curious and spontaneous. Early career plans to a person born on the fifth of May are not at all unusual as your curiosity helps you soon decide what you want to do. Your capacity for thinking and acquiring information along with excellent communication skill allow you to talk your way into favored job positions. You usually have good judgment where finances are concerned and will be generous with money when you have plenty. Your ambition and intelligence keeps you focused and helps you budget effectively and save for the future. Financial security is something that you feel measures success much more than materialistic gains. For a Taurus, the person born on the fifth day of May is typically quite sociable and in touch with the feelings of others. Although you feel deeply in your youth you may be fickle and not as willing to settle down as many of your zodiac equals. Intellectual bonds are usually just as essential to you as the physical attraction when seeking a compatible partner. You subdue your independence eventually in favor of the warmth of togetherness when you believe you have met your destined soul mate. You will insist on a high degree of respect and trust before you contemplate the responsibility of a long term love commitment. Your plentiful libido and inventiveness make you playful, sensual and open minded in the bedroom. You are turned on by sensory indulgences and your spontaneity assists you to keep romantic partnerships exciting physically and mentally. Some health problems experienced by those born on May 5th are inclined to be connected to your tendency to want to do everything quickly. Your hastiness can lead to rushed meals, silly accidents, fatigue symptoms and stress. All the side effects caused by rushing are likely to put unnecessary strain on your overall vitality. It is probably advisable to recognize your haste and aim to slow down a little to avoid getting too stressed, tired or clumsy. People born on this day could benefit from a mind calming and clearing relaxation technique like Yoga to stay fit and relieve tension at the same time. Your main strengths of character are ascertainable in the determined convincing manner and insightfulness you possess. These positive traits compel you to accomplish the things that you want most in life. Your friendliness and inquisitiveness enhance your sociability permitting you to feel comfortable in any social circle. Negative personality weaknesses for those born on May 5th are centered on your idealist inclinations and coolness emotionally. You have the tendencies to sometimes display insensitive or dogmatic behavior as well as possessing pronenesses to bouts of jealousy and perfectionism. 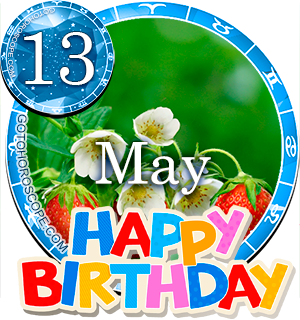 Being born on the 5th of May makes you naturally desirous of knowledge and keen to explore anything new or interesting. This interest makes you eager to learn so you are likely to be an avid student and as a rule base goals on advancing your awareness and understanding. You like to endeavor to achieve something worthwhile and charitable whenever you are able to and gain much satisfaction from doing so. Dreams and wishes seem to be focused on nice memories of the simple things you appreciate in life and hopes of happiness. Money rarely features highly in any of your personal or professional aspirations. As you were born on the fifth day of the month your date of birth digit is assigned a Root number of Five. This numerical reference to your birthday has the keyword 'Inquiry' recognizing your fervid desire to know and broadmindedness. The 5th card, the Hierophant, in the Major Arcana Tarot has an association to your birthday. This esoteric symbol denotes your admirable astuteness, self reliance and dependability. The luckiest gemstone for May the fifth birthdays is believed to be a Diamond, wearing it promises to promote positivity and wealth and protect you from jealousies and misfortunes. Astrologically the planet Venus's influence is considered to be the most powerful determiner on the likelihoods of the personalities of Taurus individuals. The actual day you were born on, the fifth of May is governed by another planetary power, Mercury. Hence the combined influences of these 2 celestial bodies are imagined to partly determine your uniqueness. Your expressiveness helps you get ideas and opinions across while your discernment lets you quickly evaluate situations. These fine attributes should help you constantly move forward and take advantage of all life has to offer. Your insightful loyalty empowers you to successful, happy and productive in relationships with others. If you can attempt to be less obstinate and try to slow down your body and mind a tad it may make you feel happier. A conclusive thought for people born on May the 5th is to never be fearful of admitting or learning from your mistakes. This is my ex to a T. Really cool guy. Definitely presuasive and insightful. He could definitely fit in any social circle. I really admired that about him. The negative aspects of his personality - emotional coolness, insensitivity, wanting to do everything quickly - were very painful for me as a September 2nd birthday. It is quite amazing. Very true about me. However, I am not lucky to have a spouse of my choice, job and finances as wished to have. I am so so so happy for my joyfully life. Now I am underatud that what can I do? I can relate to that..so much! Wow! It was like reading a book about myself... Though, I haven't had so much luck whn it comes to friendships/relationships or jobs but there has been heaps of lesson learnt. But hopefully it will be resolved in the future! 100% writhe I'm so suprice..
Hope Luck comes my way. born in 1959...very eerily close. What about my soul mate? That's horoscope for you my dear. I am may born ...... lucky to be .... oohh!!!! Haha. This somewhat applies to me. being born on may5th 1987, I would have to say it is uncanny how close these pridictions are. However, if you add a slight disposition for celliac to this, that would be great. The only thing in my life that has honestly slowed me down without realizing it until an adult. Hello we share the same birthday! same year too haha! You got me. Thanks, this was very insightful.